A year ago you would have never seen me eating a BLT anything. When my mom used to fix BLT sandwiches mine was more like a BMC sandwich; bacon, mustard, and cheese. I despised tomatoes, like wouldn’t eat them on anything. Fast-forward and I experimented with my first caprese salad a few months ago and man, it was way better than I thought it would be! 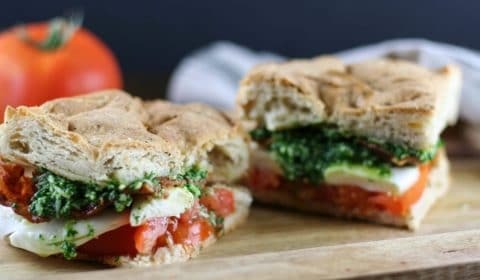 As I was scanning the interweb for some lighter options for dinner I came up with the brilliant idea of making a caprese BLT. I mean, that’s a perfect combination for a ‘new and improved’ take on the traditional BLT. 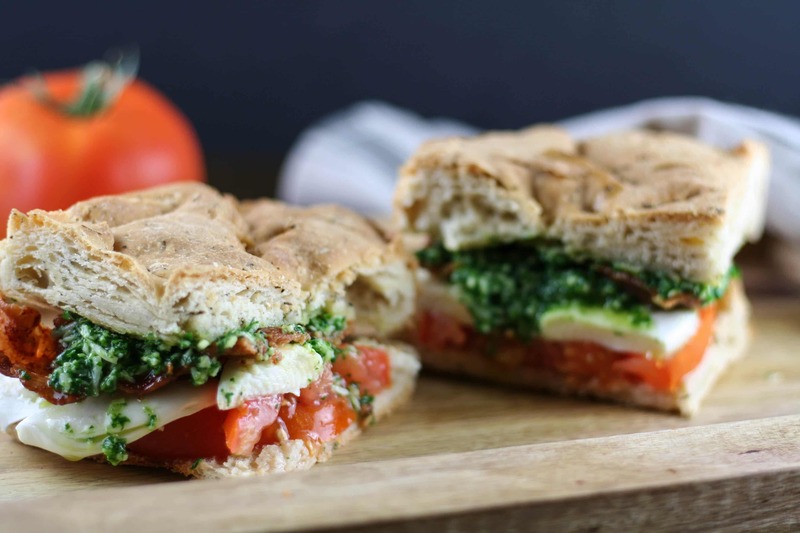 In this version you still have your traditional tomatoes, but instead of lettuce you have homemade pesto. Most traditional pesto recipes are not nut-friendly because they use pine nuts. Now, I’ve never tested the waters with pine nuts but I’d really rather not. 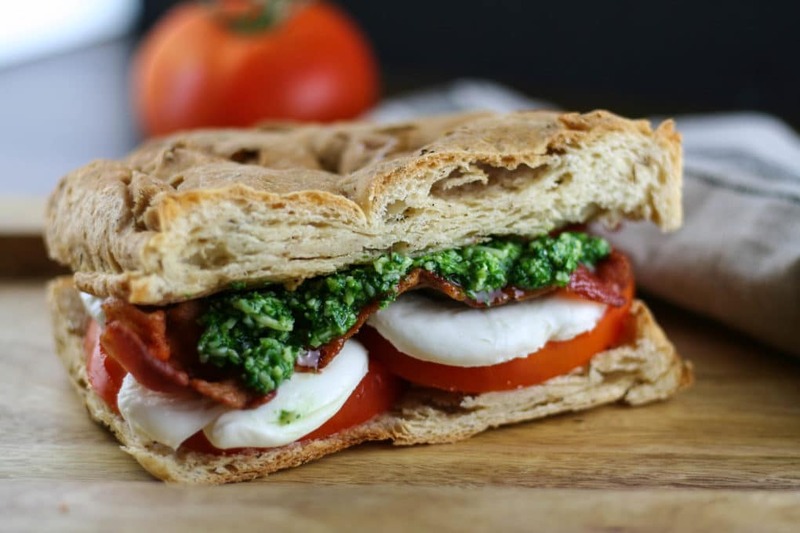 This homemade pesto recipe is made without pine nuts so it’s completely allergy friendly for those with nut allergies. I’m a bit of a cheese addict, so I did add on some fresh mozzarella cheese because hey, it’s a caprese BLT, right? I opted not to make my own focaccia bread from scratch (although I do have a recipe I’m dying to test out). For this version I turned to one of my favorite gluten-free bakeries and used Canyon Bakehouse’s Rosemary and Thyme Focaccia bread. Make the pesto first by combining all ingredients into a food processor and blending until well combined and you have a nice paste. Slice focaccia bread and place in toaster. Brush on olive oil once toasted. Assemble the sandwich starting with a layer of fresh tomato, mozzarella cheese, bacon, then pesto.